There are two types of walkers in your city: destination walkers and roaming walkers. Destination walkers are for example storehouse deliverymen and agora vendors: they have to go somewhere to pick goods up or deliver them. Roaming walkers usually provide services to your houses (or buildings), they are for example superintendents, water carriers and athletes. Destination walkers will usually go quite a good distance to carry out their jobs, roaming walkers do not: if they're not restrained by roadblocks or road ends, they'll walk a certain number of tiles, then turn around and go back to the building they came from using the shortest road possible. How far roaming walkers will wander is crucial to the layout of your housing block: if you make a loop too long, some houses will for example run out of water every few months. It starts north of the building and searches clockwise for a road. The first one it finds will be the exit and entry point for the building. 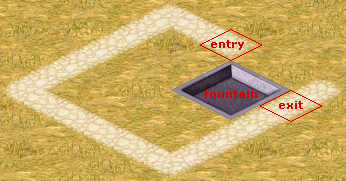 So, for example for a fountain, exit points can be the following, the tile with the lowest number that has a road tile will be the exit point. As you can see in the walker distances table, the limiting factor in building housing blocks seems to be the fountain and the infirmary. However, there's a catch: for all other buildings, the entry point is the same as the exit points, but for fountains and infirmaries, it isn't. When walkers from fountains and infirmaries turn back to their building, they always try to go to the tile that's directly north from the building, and that tile doesn't touch the fountain/infirmary itself. If you do it clever, the water carrier/healer will walk much more than 27 tiles back and forth. The road tile named 'exit' is where the water carriers will exit the fountain, the tile named 'entry' is to where they'll return to the building. You can make the bit of road between 'exit' and 'entry' as long as you like, the water carriers will walk ALL of it. This same principle also holds for the infirmary. You can use this 'feature' to your advantage.